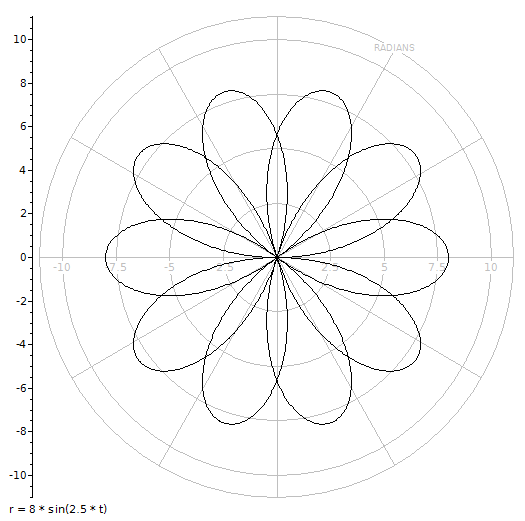 A polar plot shows a function or data expressed in polar coordinates, where each point is defined by the radial coordinate "r" and the angular coordinate "t". This is is useful in situations where the relationship between two points is most easily expressed in terms of angles and distance. Any X-Y style chart, including function and data plots, can be converted to polar form simply by selecting Polar Plot from the Axes menu. Where "r" is radius, and "t" is the angle specified in the units of graphing window's angle mode. Polar grid lines will also be drawn instead of the usual cartesian grid. See right. If you explicitly use angle "t", instead of "x", polar coordinates will be used automatically. Polar grid lines, however, will only be drawn when the Polar Plot option is selected from the menu. Note that the use of both the "x" and "t" variables in the same input string is disallowed. See also: Graphing & List Window, and Graphing Examples.